A mobile reference app can be a life-saver. Maybe you are writing at the beach and can’t find the right synonym. You might want to look up a quick definition when finishing up a school project. Or maybe you’re working in the park and need a translation. For each of these situations, and many others, here are the best mobile apps for looking up what you need quickly and easily. Having a dictionary on your device lets you perform quick word look-ups for definitions, pronunciations, and more. The Oxford Dictionary app lets you look up word definitions three different ways. 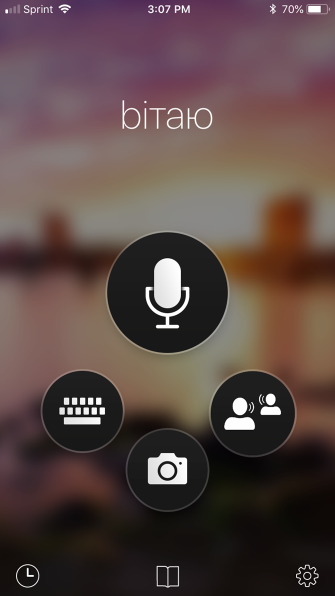 You can type the word in the search box, tap the microphone to speak it, or use the camera button to scan it. 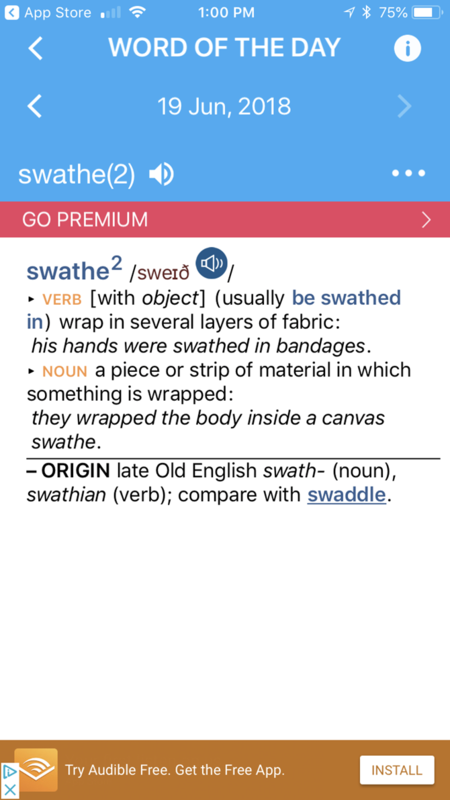 The app offers a Word of the Day to enhance your vocabulary, recent list of words searched for quick reference, and a Favorites section for saved words. If you’re interested in additional features like an offline dictionary, audio pronunciations, and ad removal, both the Android and iOS versions offer premium upgrades. But for the basics, the free version is a great resource. English Dictionary for Android is another helpful reference. The app provides cool customization options for theme, font size, and line spacing, so you can adjust the settings to your preference. 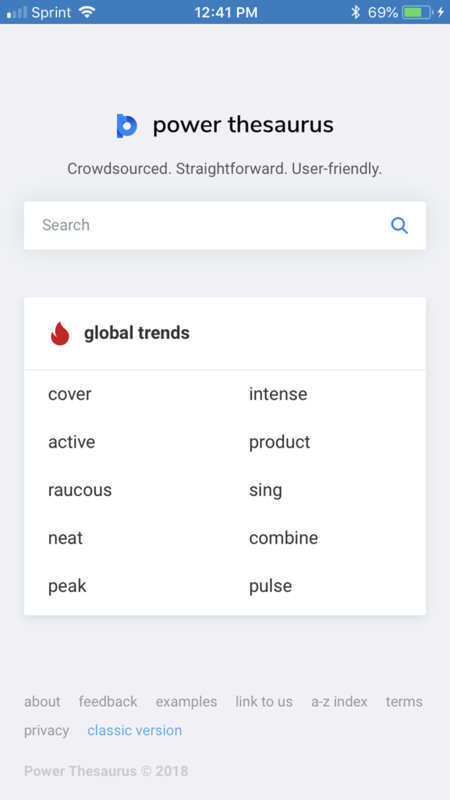 You can use the Random Search feature to learn new words, use text-to-speech options, and see a full history of your searches. Add and back up notes to services like Google Drive and Dropbox, get help for puzzles with the Crossword feature, and enjoy an easy-to-use, offline dictionary. For students writing essays, writers crafting articles, or anyone else looking for synonyms, a thesaurus is a handy reference. Pocket Thesaurus is a terrific offline thesaurus. Just enter your word to see synonyms as well as antonyms. 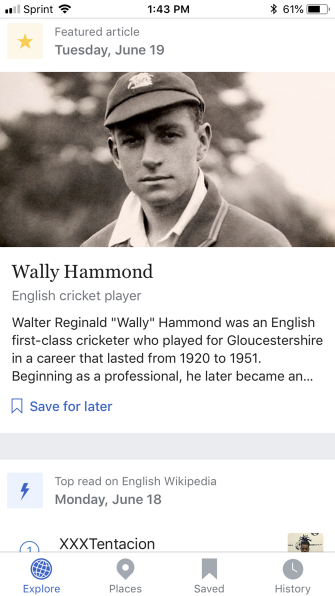 You can save words to reference later and view a history off all your searched words. You can also share words, perform crossword puzzle searches, and use either a light or dark theme. If you want to hear a word pronounced out loud, just tap the speak icon. With over 90,000 words, Pocket Thesaurus is an excellent resource available for free. Plus, there is a premium version for Android that removes the ads. For a simple and clean pocket reference, take Power Thesaurus for a spin. The app will automatic display suggestions as you type, which is helpful. Then when you arrive at the word, you’ll clearly see the synonyms in a list. The app provides a customizable list for your word searches. For instance, you can look for antonyms, narrow the search, broaden it, or find rhymes. You can add, remove, or rearrange each of these options. 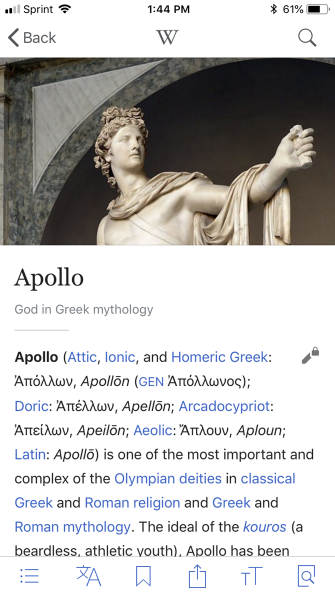 So each time you look up a word, you’ll have just the tools you need. The app is free and offers an ad-free pro version for Android. If having a dictionary and thesaurus combination app is what you really need, these are great options that give you both in one convenient package. 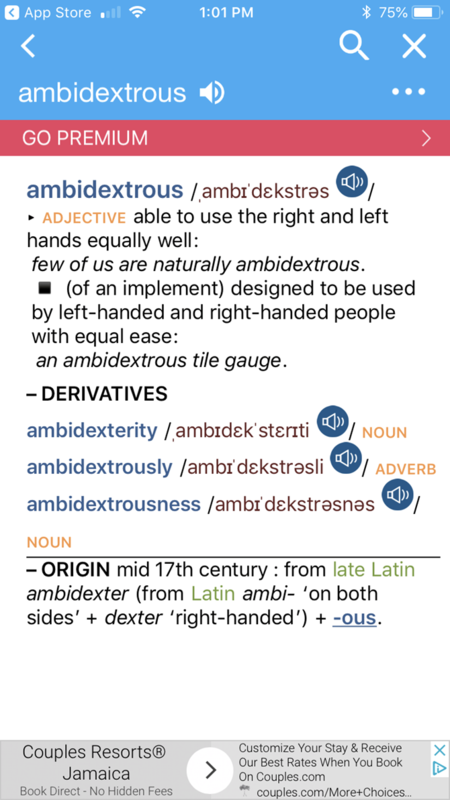 Dictionary.com is a definite favorite website for both a dictionary and thesaurus, and its app is great too. Open the app and simply move the slider between Dictionary and Thesaurus for what you need. The color changes for each option so you always know where you are. Enjoy browsing through the Word of the Day, Word Trends & Stories, and even Quotes, all on the main screen. When you look up a word, you can hear it pronounced, check its origin, view examples, see words that rhyme, and much more. 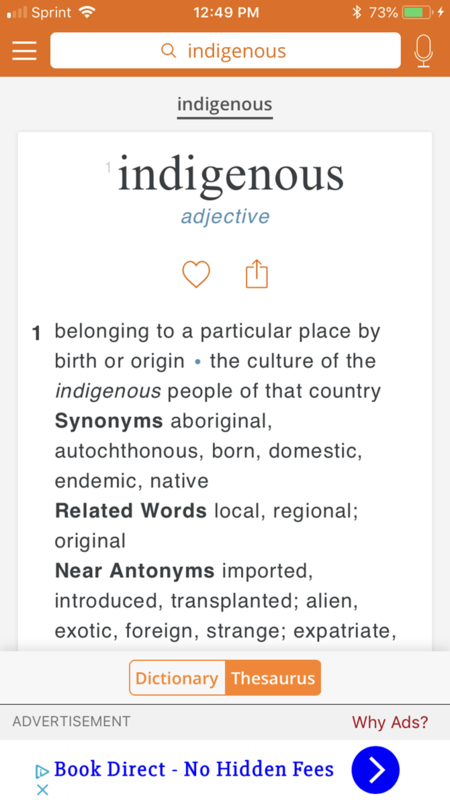 The Dictionary.com app does offer upgrades to these features via in-app purchase. You’ve likely heard of this app and that’s with good reason. Merriam-Webster has been helping people with words since 1828. 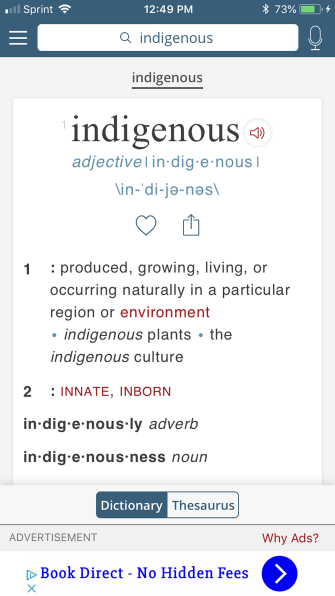 When you open the Merriam-Webster app and tap to enter a word, you’ll immediately see buttons for Dictionary and Thesaurus right below the box. Just tap the one you need. Once you see the word, you can tap at the bottom to move between the dictionary definition and thesaurus synonyms quickly. 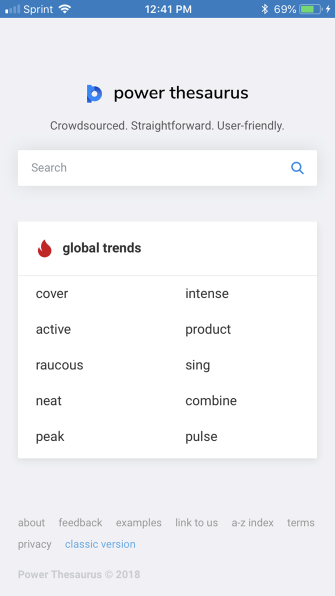 The app also offers a recent history of searched words at the top, Word of the Day, option to save your favorites, and word games for a little fun. If you’d like to remove the ads, you can do so with an in-app purchase. 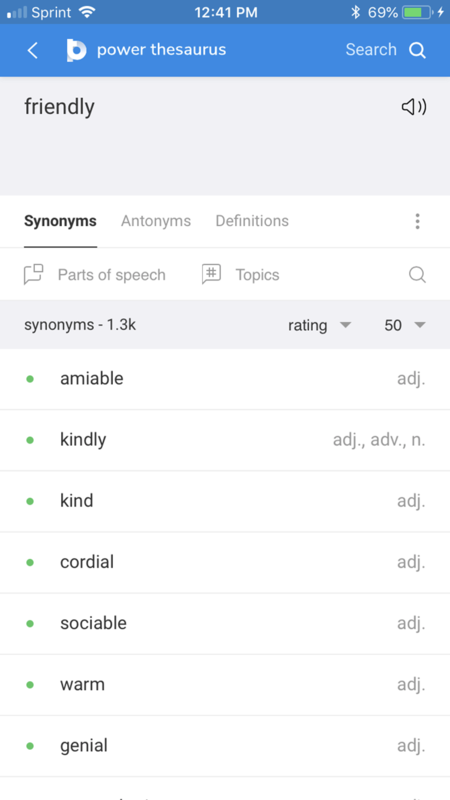 We’ve taken an in-depth look at Merriam-Webster’s app if you’re curious. The simply named Dictionary by Farlex is one more dictionary and thesaurus combination app to check out. Once you pop in a word to look up, you can tap buttons at the bottom for Definition, Thesaurus, or Translations. Other great features of the app include bookmarking your favorite words, sharing with friends, and creating flashcards. You can also access an offline mode, customize the home page, receive daily notifications, and adjust the font size. So for another terrific reference app, take a look at Dictionary. For information about anything, an encyclopedia is an invaluable tool. 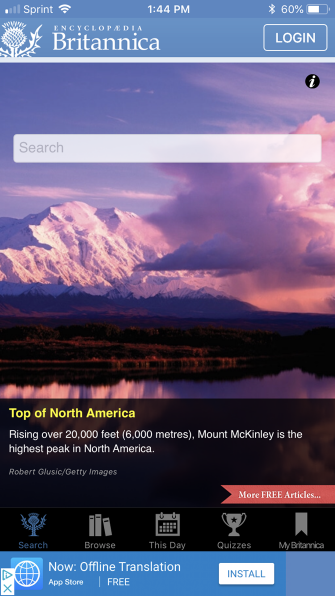 For research right on your device, check out these encyclopedia apps. When you need an encyclopedia, what better source is there than the well-known Encyclopedia Britannica? The app lets you search, browse, and see what happened in history for the current day. In addition, you can check out quizzes to test your knowledge. Tap My Britannica at the bottom to see a list of your recent searches, favorites, and saved items. One standout feature of the app is the page-turning. When you receive the results of your search, it feels like you’re actually turning the pages of a physical encyclopedia. The app is only available for iOS and contains limited content and ads. You can subscribe to a plan to unlock all the content and remove those ads. Encyclopedia by Farlex is another great option. This is the same company that provides the Dictionary app mentioned above. On the simple main screen, just enter your search term and you’re on your way. You can mark items as favorites, share using your default options, and adjust the font size. If you want to remove the ads, you can do so with a simple and affordable in-app purchase. 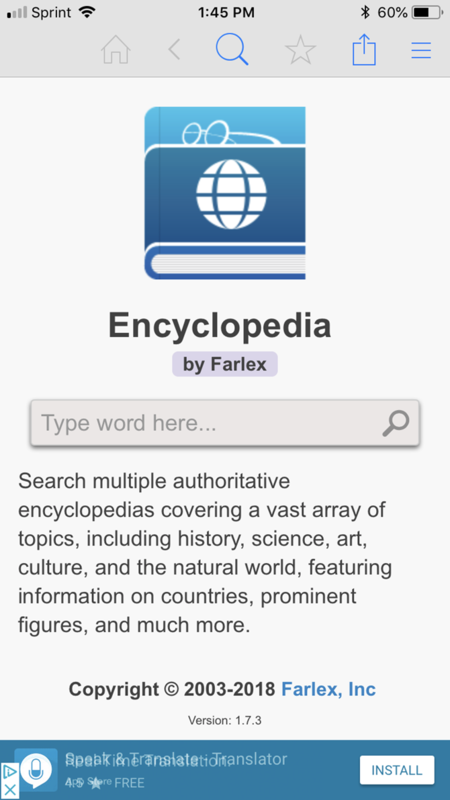 For a helpful encyclopedia that works on both Android and iOS, give Encyclopedia by Farlex a try. 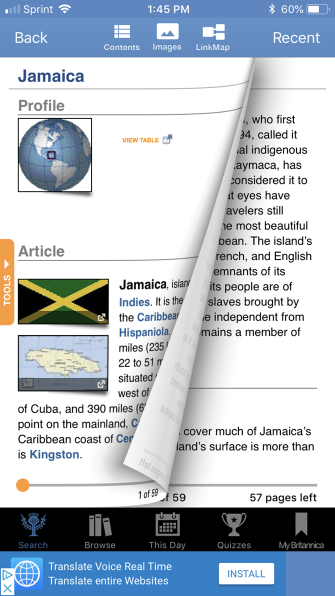 If one of your preferred online sources for information is Wikipedia, then you’re in luck because it has a mobile app. The main screen is full of items that you can browse through like featured articles, the picture of the day, and places to explore. 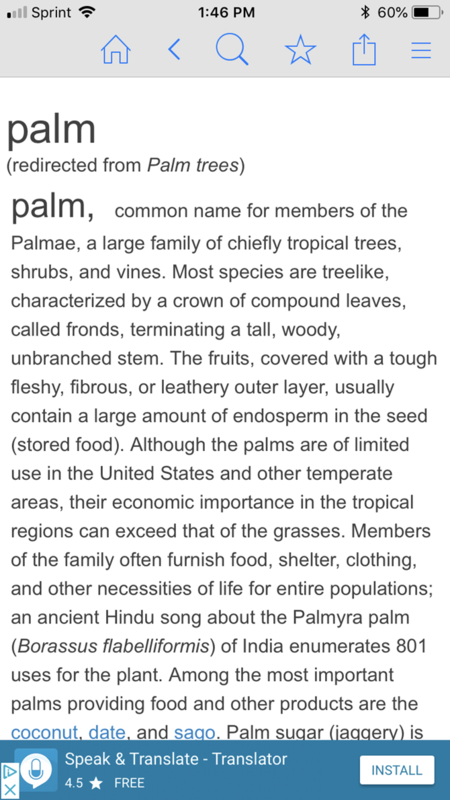 If you have a Wikipedia account, you can also log into it easily from the app. When you use the search feature to find something specific, you receive the details just like on the web. Then you can add the item to your reading list, share it with others, or change the language if needed. In addition, you can customize the font, brightness, and background color for easier reading. The Wikipedia app is a wonderful tool for fans of the website. Whether you are traveling or just need to communicate in a different language, a translator in your pocket makes speaking or writing another tongue easy. 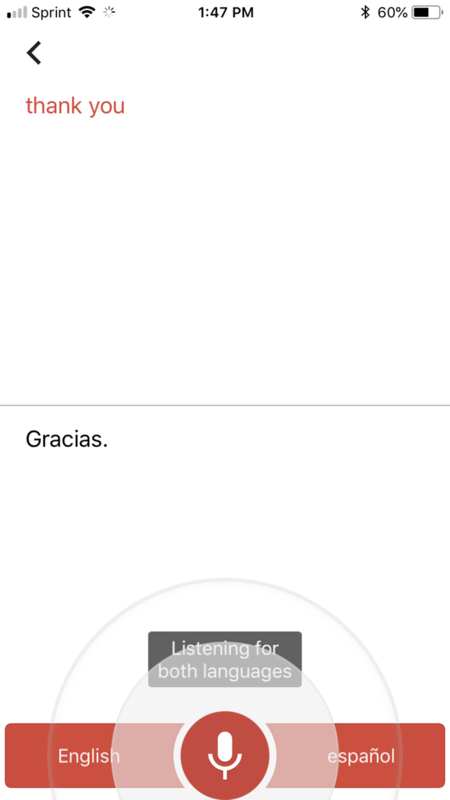 Microsoft Translator is a sleek app with cool ways to obtain your translations. You can speak a word or phrase, type it, or snap a photo of it. Choose your language or use the auto-detect feature, then pick the language you want to translate to right at the bottom of the screen. When you receive your translation, you can pin it for reference, share it from within the app, or have it spoken to you out loud. But that’s not all. 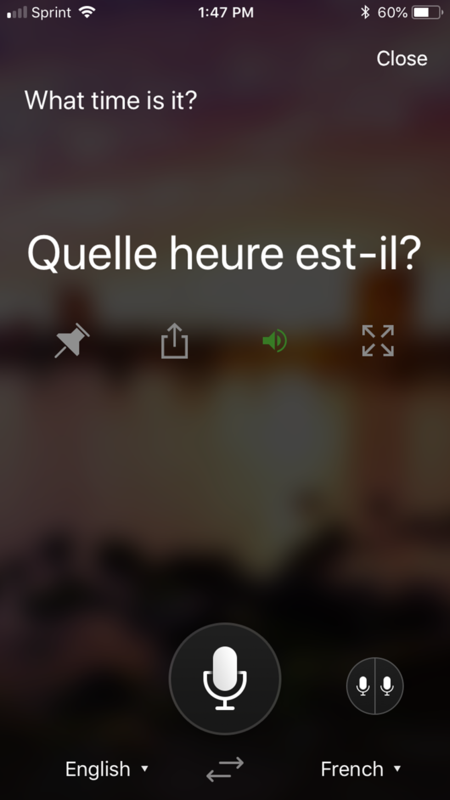 An awesome feature puts the translation into full-screen mode (landscape view). So you can even show it to the person you’re trying to communicate with, which makes Microsoft Translator the ideal language tool for many situations. 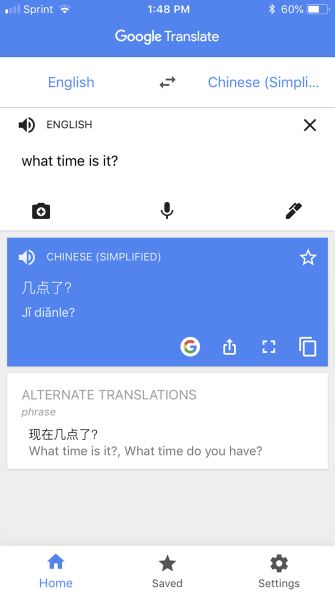 Google Translate offers similar options to Microsoft Translator. You can type text, hand-write it, use your voice, or take a picture. 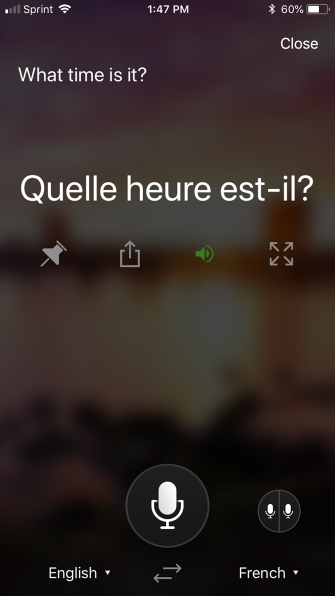 But in addition to these options, you can have the app listen to your conversation—which is a standout feature of this translator. The app also lets you save items, download languages for offline translations, and is super easy to use. 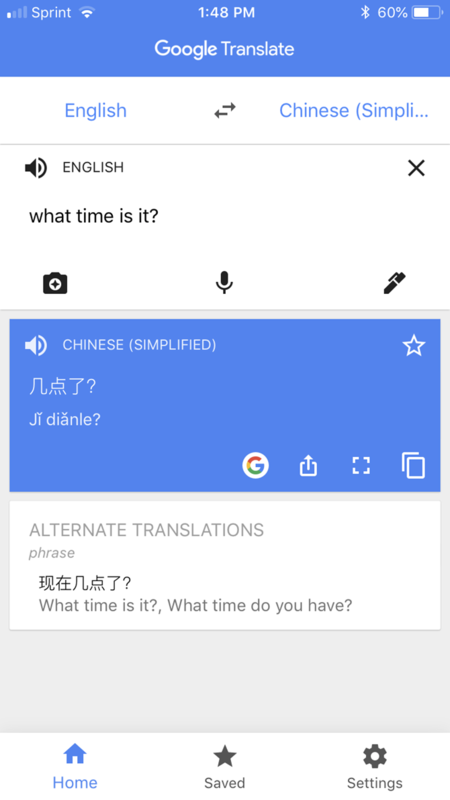 If you prefer to use Google Translate on your PC, this is the mobile translation app for you. With these apps, you can look up word definitions, find synonyms, get details about people, places, or items, and translate text. Once you download that helpful reference app, you’ll always have it with you when you need it. For more must-have mobile apps, check out little-known but handy iPhone apps and Android apps that make life easier.